So, here is the first chapter of the translation I am ‘proofreading’.The whole first part of the book is a critique of capitalism and its traditional critics, so it is quite ‘negative’. That’s my excuse for working on it so slowly. The second part, which tries to find solutions, is much more fun, so I am looking forward to that. Let me know what you think, especially so we can see if disagreements arise from imprecise translations and correct them! Another reason why I am procrastinating is that I have been doing related work like trying to improve the Wikipedia article on Jaime Semprun (to whom Jappe’s book is dedicated). I started translating the French existing article, but it is a mess, so I am thinking it needs a complete reworking. And I went on another tangent when I realised Maria Isidine did not have a Wikipedia article at all. I tried to get people interested in helping create one, but all I got was a reply that another woman anarchist, Clara Gertrud Wichmann, did not have a page in English… And I am sure we could make this list longer, and please leave a reply about this. This needs to change, and no-one but us will care and can change this. I don’t have much experience writing Wikipedia articles, apart from the Jaime Semprun fiasco, the only article I wrote was about Lawrence Storione, so any help is more than welcome! I think the anarcha-feminists at the St. Imier congress in August 2012 decided to organise an international anarcha-feminist congress some time in the next two years, although it seems to be the best kept secret in anarchism. Obviously, it needs preparation, and I was contemplating how creating/translating articles about anarchist women on Wikipedia could be part of this work. To help write this article in English on Clara Wichmann. To help with the article on Maria Isidine. To help with the article on Marie Ganz. To help with the article on Anna Sosnovsky. Today, I shall mainly compare an English translation of this book to the French original, shown here with our resident pin-up. I am ecstatic that people awesomely volunteered to translate this book, which you will soon be able to enjoy. Accessible value-critique essays, dedicated to someone with conflicting ideas (Jaime Semprun) instead of being obsessed with denouncing and belittling always more ennemies! If anyone knows of any publisher who would be interested though, that would be extremely useful! 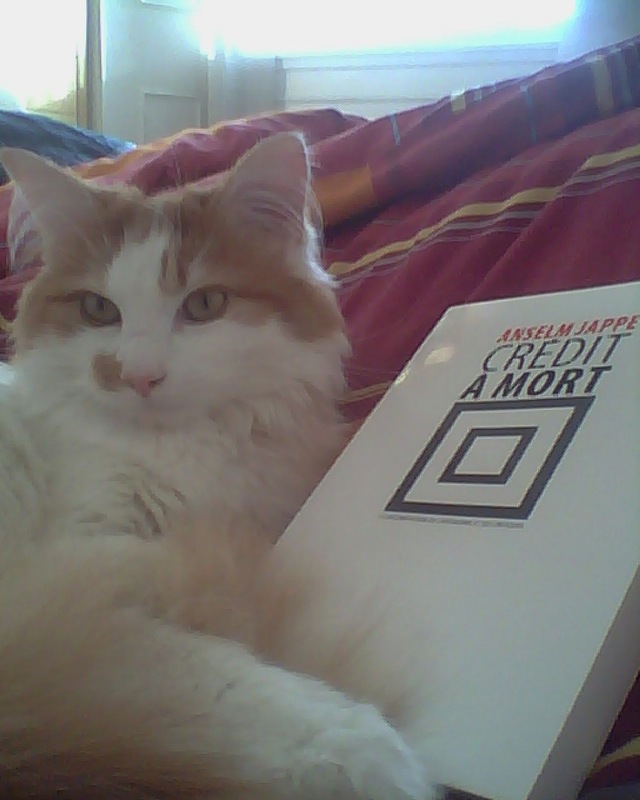 This work made me realise that quite a few passages in Crédit à Mort are quite humoristic. Not laugh-out-loud funny, but they do make me want to pinch Anselm Jappe’s cheek. Either I’m just sad or he is a good writer.